Hi! 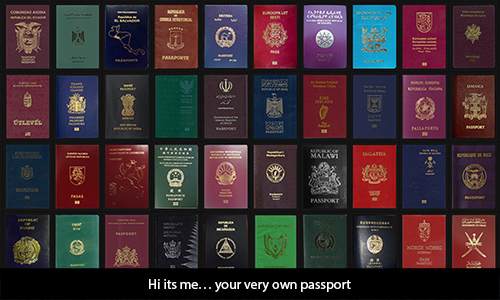 It’s Me… Your Very Own Passport! Normally I am so stern looking on the outside and so ‘flippy’ inside! I have seen people getting into big trouble when they mess with me. Well that makes me extra special! No one will let you cross the borders if you don’t have me with you! I am not just your identification proof; I keep a track record of where you have been, despite your home country, and where you have decided to go. All your time spent and highly costly degrees and certificates will never be as important as me... sorry! Too Bad! But I wasn’t always the same tiny booklet always and I was not born yesterday. The earliest mention of me was made back in 450 B.C. If you own me in Canada you will find a letter of the same sorts as Nehemiah had inside of my front cover asking for a safe course! I became highly popular when King Louis XIV of France marked me as ‘letters of request’. I was personally signed by the king and was granted to his favorites in court. I was called “passé port” and it meant “to pass through a port” because the people who carried me were sailors and the only thing they travelled on was ships which crossed each port. That’s how I got my name “Passport”. I have seen trips and turns of every event throughout the history of immigration and travelling. I was there when the Britons were had maximum hold on the world. I was there when America was looking for trustworthy candidates during Civil War and everywhere else. I was a simple sheet with ten blocks having an official seal on it. But people misused me when I was in such a malleable form. In 1985 I was made into a machine readable format which was set to meet the criteria of ICAO (International Civil Aviation Organization). That’s how you found me! Now my modern avatar is very well known and I encrust my cover with the emblem of the country you belong to. My not so-simple journey from being a simple letter came to a point where I became the most important document to carry when you want to cross borders.